Alpine Meadows hosts guests from across Canada and the world. We are in a remote and exceptionally beautiful location near Wells Gray Park, and visitors arrive by car or RV. Just be careful of the wildlife crossing the road! With a safe and well-designed highway system, we are a convenient drive from Vancouver, Kelowna, Jasper, Calgary, 100 Mile House, Spokane, and all points in-between. Alpine Meadows is delighted to welcome our guest from places near and far! The Resort is accessible by car or motor home. Please note that we are located along a mountain pass in the BC wilderness; the road to reach us is only partially paved, and the neighbouring wildlife can be unpredictable! We recommend planning to arrive during daylight hours, as well as giving yourself ample time to drive carefully and slowly (it’s a beautiful drive, you’ll want to enjoy it!). Please see below, or email us for detailed directions from your point of origin. Please note: we do NOT recommend relying solely on GPS devices, which have proven unreliable in this area. Google Maps tends to be more accurate. If your travel plans lead you to arrive later than 9pm, please contact us in advance to make check-in arrangements. Dinner reservations may not be available for late arrivals to Alpine Meadows. Driving south from Clearwater on Highway 5, turn southeast onto Clearwater Station Road (at the Wells Gray Inn/Pub). Continue along Clearwater Station Rd for 2 km/1.25 mi, until you reach a narrow bridge. Cross the bridge and then a set of railroad tracks. 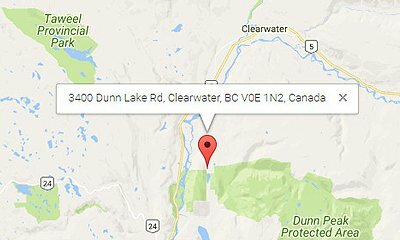 Clearwater Station Road is now Dunn Lake Road (note: the road is compact gravel from this point). Continue south on Dunn Lake Road for 20 km/12.5 mi. The stone Alpine Meadows entrance gate, indicated by roadside flags, will be on the left. 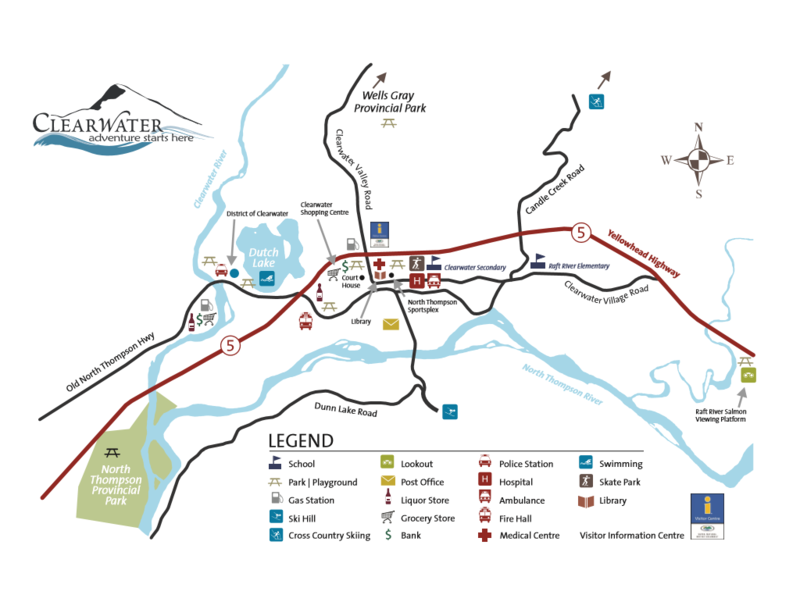 See Map (.pdf) for driving directions from Clearwater. Driving north on Highway 5 in Barriere, exit right at the PetroCan Gas Station onto Barriere Town Road. Continue for 3 km/1.8 mi. across the Barriere River, to the intersection of Barriere Town Road, Barriere Lakes Road, and Dunn Lake Road. Continue along Dunn Lake Road for 39 km/24 mi. The stone Alpine Meadows entrance gate, indicated by roadside flags, will be on the right. Travelling north on Highway 5, turn east onto Ferry Road (look for Red’s Roadhouse/Pub). Take the Little Fort Ferry across the North Thompson River. Drive straight off ferry onto Ferry Road, then turn left. Pass the train crossing, and continue on Ferry Road for approximately 6 km/4 mi. Ferry Road becomes Windpass Road. At the intersection of Windpass Road and Dunn Lake Road, turn left onto Dunn Lake Road. Continue north along Dunn Lake Road for 7 km/4.25 mi. The stone Alpine Meadows entrance gate, indicated by roadside flags, will be on the right.